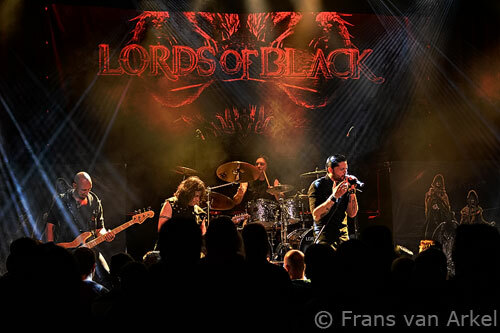 Lords of Black is a power metal band from Spain. Bands from those regions often struggle to break through. 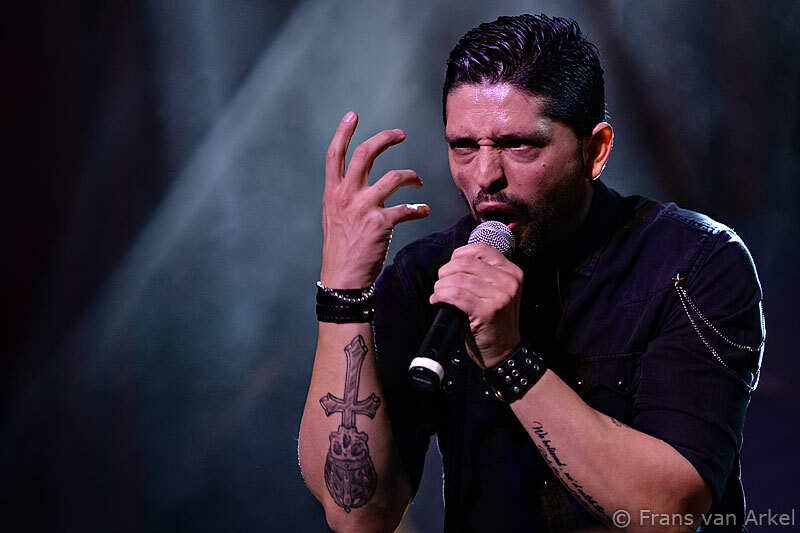 However, Lords of Black last year got a huge boost when singer Ronnie Romero also became the new frontman of Ritchie Blackmore's Rainbow. Blackmore decided to do after 20 years once again some rock concerts and his eye caught Romero. Romero who's voice has similarities to the original Rainbow vocalist Ronnie James Dio did these three concerts in Germany and England last June. The result of this was that Lords of Black became on the radar of many hard rock fans. In September the band played already over here as support-act for Axel Rudi Pell in Weert. Several fans came to that show especially for Lords of Black. This month the Spanish power metal band is doing its own European tour with two concerts in the Netherlands. On Friday night, they were in the Boerderij in Zoetermeer, followed by a performance at Manifesto in Hoorn a day later. 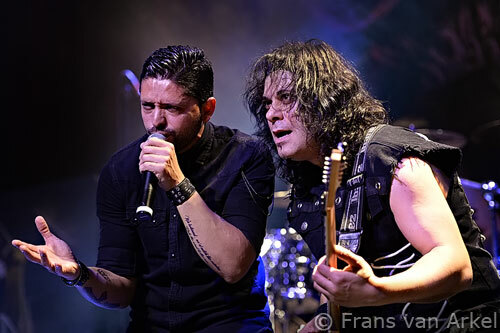 Lords of Black was founded in 2013 by two former Saratoga members, guitarist Tony Hernando and drummer Andy C. In Ronnie Romero, who is born in Chile, they found their frontman. In 2014 they released their debut album "Lords of Black". Earlier this year, the successor "Lords of Black II" came out. 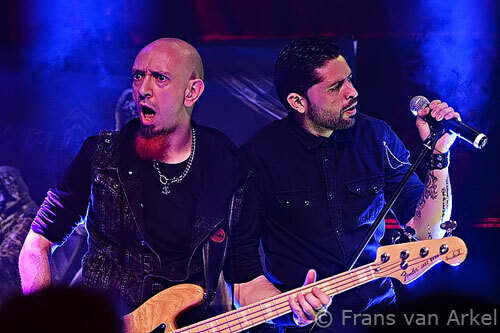 On this latest album bass player Víctor Durán is no longer with the band. He is replaced by Javier Garcia, even though he came just after the second album was completed in the band. Tony Hernando is also responsible for all the bass parts on the latest CD. In Zoetermeer the Danish metal band Savage Machine was opening the evening. Savage Machine exists two years and so far the band only released the EP "Through The Iron Forest". Still they even played at the prestigious Wacken Festival in Germany. The quintet plays old school metal and they have listened clearly much to Iron Maiden and Judas Priest. Still that is not a disadvantage. In the half hour they are on stage Savage Machine play good enough to keep the attention of the audience. For a support act they do fine tonight. Lords of Black may be on the way up. They do not get the Boerderij filled. It will be no more than only an half filled venue tonight. When a celebrity like Iron Maiden's bassist Steve Harris earlier this week even did not manage to lure more fans to this venue this might be understanding. Visitors to the concert of Steve's band British Lion last Tuesday evening can on presentation of their ticket for free to this show. Even that does not ensure a full house. Yet the people who decided to stay back home are wrong. Lords of Black is one of the newcomers to the metal front which distinguish themselves positively. With a good mix of songs from their two albums the band put down an excellent set tonight. With 'Merciless', 'Nothing to Fear' and 'Everything You're Not' the band is well out of the starting blocks. The audience does not immediately reacts very enthusiastic but Ronnie Romero gradually knows well to stir up the fire. He gets the crowd more and more in the mood. That also affects the Lords of Black visible. They seem to enjoy their selves pretty well tonight. Guitarist Tony Hernando scatters continuous with power riffs and also knows his way around in shredding his fretboard. Andy C is kicking his double bass drums like all the great drummers in the old days and bassist Javier Garcia with his dyed red goatee is a great bassplayer who also entertains the audience with his grimaces. And then of course there is Ronnie Romero. When you see and hear him perform, it is clear why Blackmore called him a cross between Ronnie James Dio and Freddie Mercury. With his class voice he convinces everyone this evening. The fast power metal is standing like a rock and the Lords prove that in their two parted 'The Art of Illusions' which is divided into 'Smoke and Mirrors' and 'The Man From Beyond' with some great instrumental passages. The band gets throughout the concert better and better. The crowd really starts to dig these guys from Spain. Tony gets a solo spot in 'Ghost of You' and after some more songs they even improve more when they come to the end of the set. The intro of 'Doomsday Clock' is the start for the song that the band is named after, 'Lords of Black'. The beautiful 'Cry No more' is dedicated to Phil Lynott. The song is also about the in 1986 deceased Thin Lizzy frontman. With the strong and fast 'Shadows of War' they end the set. It is not long before the foursome returned to the stage for a series of encores. First they do the long 'When Everything Is Gone'. The fire is once again turned up when songs known from Ronnie James Dio are played. The venue goes wild when they finally play some well known songs to finish this night. With Dio's 'We Rock' and Rainbow's 'Kill The King' the band rewards the audience for their enthousiasm. Great way to end an already superb show. Despite the half empty venue this was a great night.